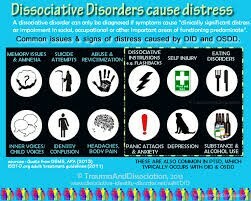 Most doctors agree that Dissociative Identity Disorder is caused in the past by the patient's brain trying to block out traumatic or horrible memories/events that had happened in the their early childhood. the patents developing brain copes with these memories/events by separating themselves for the outside world mentally through causing memory loss or depersonalization. even after the threat has passed the subject still uses these techniques subconsciously. long after the terrible events have long since past for years or even decades for the patient, the brain continues to use these same sort of methods to shield its mind form the difficult memories whenever they pop, building use on top of each of years and years, to the point of developing 1 or more personalities outside the original one to deal with the memories instead. *there is no medical cure for D.I.D. *most doctors agree that psychotherapy is the best way to cure D.I.D. why should you care about D.I.D! We all as a nation, should think about dissociative identity disorder, because it’s a very serious thing, and oftenly is mistreatment in poplar culture and on the inter webs. I knew this crazy [ fellow student] and he was completely off his rocker! the everybody said that he just had A.D.H.D. but i never believed that it was just ADHD in him at one time. he shielded the outside from himself and everybody made fun of him. he was in a world of his own to the point of putting someone who regularly made fun of him over me. His strangeness never seemed to not be baffling in different ways. I talked to school psychologist about him, we had many conversation about him. Now he’s somewhere else for better or worse. Every now and then i remember him, and it saddens me, that no one was able to help him or even try to help him. D.I.D is created and can be stopped in early stages of childhood, so if we make our world better for the children, not as many people could ever get this horrible personality disorder.